Definition at line 6 of file vdmdbg.h. Definition at line 5 of file vdmdbg.h. Definition at line 34 of file vdmdbg.h. Definition at line 41 of file vdmdbg.h. Definition at line 11 of file vdmdbg.h. 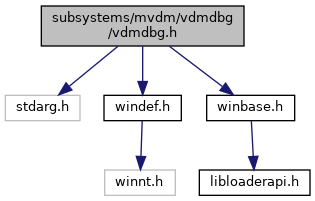 Definition at line 10 of file vdmdbg.h. Definition at line 420 of file debug.c. Referenced by CreateSecurityPage(), DllMain(), EditSecurity(), GetDisplayStringFromSidRequestResult(), GetPrincipalAccountNameString(), LoadPermissionsList(), SecurityPageProc(), UpdateControlStates(), and WlxInitialize(). Definition at line 65 of file vdmdbg.h.